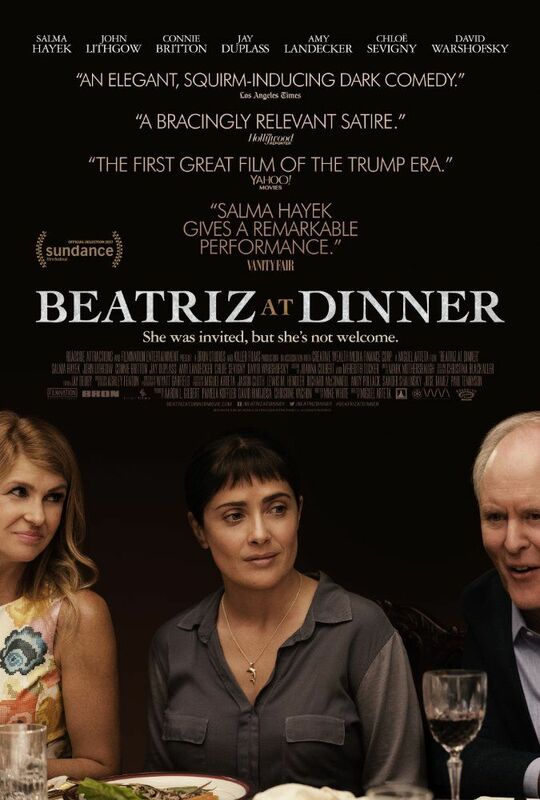 The film opens with Beatriz (Salma Hayek) waking up, taking care of her animals, and heading off to work at a massage therapy center where she meets with her clients. She then heads off to meet with Kathy (Connie Britton) to give her a massage before her dinner party. During the massage, Beatriz reveals to Kathy that her neighbor had killed one of her goats, and becomes emotional. Beatriz leaves and heads to her car, where it is unable to start. She goes back inside, to tell Kathy her car broke down, and her friend won't be able to help her until he gets out of work. Kathy invites Beatriz to stay for the dinner party. Kathy checks with her husband Grant (David Warshofsky), who is reluctant due to the high profile client they will be having dinner with. He ultimately agrees. Read more on Wikipedia.